The FA announced that Austin had argued that the suspension - earned for kicking Huddersfield goalkeeper Jonas Lossl - was excessive, but that his case had been rejected. 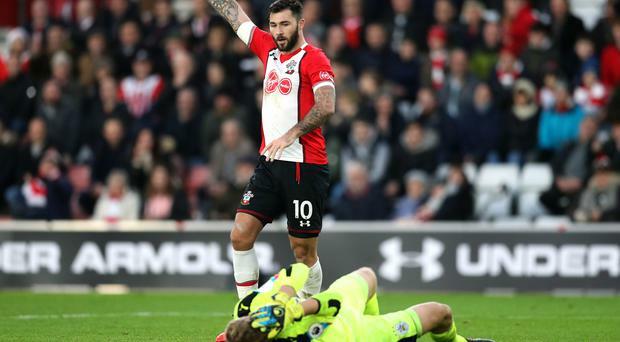 Danish goalkeeper Lossl was left with a bloodied face and a suspected broken nose following the incident in Saturday's 1-1 draw at St Mary's Stadium. Austin, who scored his fifth goal in five starts before departing with a hamstring injury, avoided punishment for the incident during the contest, but has now been banned. "Charlie Austin will be suspended for Southampton's next three matches after he was charged with violent conduct. He accepted the charge but argued the suspension was excessive. This was rejected by an Independent Regulatory Commission," the FA said. "The striker was involved in an incident which was not seen by the match officials but caught on video during Saturday's game against Huddersfield Town." Huddersfield manager David Wagner took aim at Austin following the flashpoint. ''After seeing the video footage, this should usually never happen, that an opponent hurts another opponent on purpose,'' Wagner said. ''I don't like to say this, but it looks this way. Jonas as well was absolutely surprised. This was a nasty challenge and nothing I like to see. Austin netted the opener midway through the first half, but was substituted in the closing stages with a hamstring complaint and Southampton boss Mauricio Pellegrino confirmed he is likely to be sidelined for the remainder of the festive schedule regardless. That, and the ban, means Southampton's top scorer will miss the club's next three fixtures - away to Tottenham and then Manchester United - with a home match against Crystal Palace on January 2. The Saints have fallen to 13th in the Premier League table following a six-match winless streak, and boss Pellegrino has called for improvement in the second half of the campaign. "In the middle of the season, obviously we couldn't show this consistency especially in results," Pellegrino said. "Because we couldn't win those games we deserved to win where we created a lot of chances. "But football is efficiency, so no matter how strong the build-up, sometimes you just need to score. Still we've got 50 per cent of the tournament to try to bounce back, to change this mood and hopefully that can start on Tuesday."